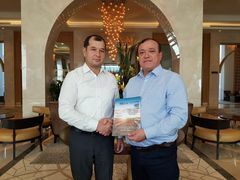 On 20 September 2018, Tashkent, upon official invitation of Mr. Alchibay Ramatov, First Deputy Prime Minister of the Republic of Uzbekistan, Mr. Ciopraga, Secretary General of the PS IGC TRACECA made an official visit and took part to the International high-level conference «Central Asia in the system of international transport corridors: strategic perspectives and unrealized opportunities». During the Conference, issues of effective and mutually beneficial use of international transport corridors, formation of a single, branched and outwardly integrated transport space in Central Asia discussed to strengthen interrelations based on mutual trust and good-neighborliness. Special attention was focused on the issues of further development of the dialogue with international financial institutions, organizations, transport unions, as well as representatives of transport and logistics companies to develop existing and form new transport corridors. The event included the main plenary session and four workshops, with participants discussing the development of the transport-transit potential of regional countries, efforts to streamline the railway transport system, to improve road transport traffic and to expand air traffic. As one of the leading speakers of the Conference, Mr. Ciopraga addressed to representatives of the Uzbek Government and distinguished participants and stressed the importance of the Republic of Uzbekistan which is on the Agenda of discussion of all TRACECA member-states nowadays, its role in the IGC TRACECA and further activities. Several international transport corridors (ITC) extend through the territory of the Republic of Uzbekistan, including the ITC TRACECA being a multimodal system of road and railway routes to ensure international combined traffic. Emphasizing the significance of TRACECA Mr. Ciopraga noted that 7 states out of 13 full members, including all Central Asia countries, are hinterland and landlocked countries on the Eurasian continent. Participation of these countries in TRACECA undoubtedly has a positive impact on their economic development. For the period of the TRACECA Programme implementation within the framework of technical assistance the total amount of more than 50 mln. Euros was allocated for Central Asia countries, including the share of about 10 mln. Euros for Republic of Uzbekistan. With the view of further improving the institutional basis of TRACECA, coordination of actions of all participants of the transport process, as well as promotion of enabling environment for multimodal transport development, in 2009 within the framework of the Seventh IGC Meeting TRACECA countries signed the Agreement on development of Multimodal Transport TRACECA. The realization of this Agreement by TRACECA countries will contribute to the development of multimodal transport and complex performance of freight-forwarding companies on behalf of multimodal transport operators. Mr. Ciopraga recommended to Uzbek colleagues to join this Agreement. Within the meeting with H.E. Mr. Jamshid A. Khodjaev, Minister for Foreign Trade of the Republic of Uzbekistan, Mr. Ciopraga emphasized a special role of the Republic of Uzbekistan, and its active participation. 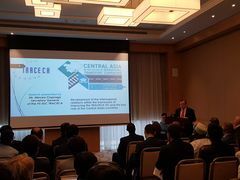 “At the launch of TRACECA Programme, Uzbekistan made every effort to make use of the transport potential of their country for the benefit of development of transport connections between Europe and Asia. Participation in the TRACECA Programme had a positive influence on the transport sector of the Republic both form the point of view of infrastructure development and – institutional strengthening, legislation improvement and capacity building of the country.By virtue of location in the centre of the Eurasian continent between large and dynamically developing markets of Europe, East and South-East Asia, economic potential and historic traditions Uzbekistan actively advocates international integration into the system of economic relations”, Mr. Ciopraga noted. Mr. Ciopraga also met with Mr. Saidrakhim Ikramov, Permanent Representative (National Secretary) of the PS IGC TRACECA in the Republic of Uzbekistan. Main issue of discussion was the status of accession of Uzbekistan to the Agreement on Joint Financing of the PS IGC TRACECA between the Governments of the Parties to the Basic Multilateral Agreement on International Transport for Development of the Europe-the Caucasus – Asia Corridor and active participation to TRACECA activities. On the outcomes of the conference participants signed a number of memorandums of understanding between states and international organizations, as well as contracts between commercial companies of Central Asian countries. These documents aims to streamline the infrastructure and to ensure freight and passenger traffic.